Meet the nuclear power worker of the future: the crawler bot.The 104 commercial nuclear reactors in the United States are now middle-aged; most were built in the 1960s and 1970s. So the utility companies that want to continue operating their aging nuclear power stations for a few more decades are developing nondestructive inspection technologies that can probe these vast industrial infrastructures and look for signs of decay.Maria Guimaraes works on nondestructive evaluation at the Electric Power Research Institute (EPRI). She says that designing sensors isn’t enough.”If you have good sensors, but you have to erect scaffolds to use them, it’s very time cosuming, very costly, and there are inherent safety issues,” Guimaraes told me. “We’re trying to find a way to do the deployment with a robot so we don’t have to send someone up there.”Her team found a commercially available robot from International Climbing Machines and went to work customizing it. The off-the-shelf model could already climb straight up a concrete cooling tower or containment vessel; it generates a vacuum that holds its foam tracks to the wall. But it had to be outfitted with a suite of sensors, and it also needed sophisticated mapping and navigation software. 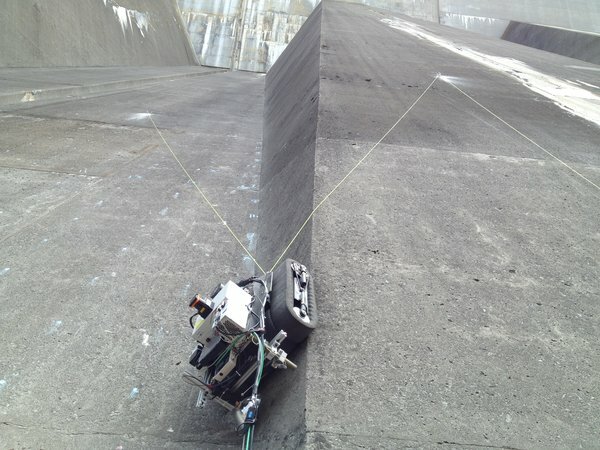 That’s crucial, Guimaraes says, because these are large structures, and the robot needs to log the exact location where a sensor records an anomaly.This July, Guimaraes and her colleagues tested the customized crawler at the Robert Moses hydroelectric dam near Niagara, New York. In addition to being useful for nuclear power stations, EPRI also thinks the crawler can be used in hydroelectric dam inspections, and theNew York Power Authority (NYPA) agreed to help with the tests.”We’ve tested on a concrete wall in the lab, but it’s just not the same,” says Guimaraes. In this real-world test, operators steered the crawler up sheer walls using a joystick controller (eventually the team wants to control the bot with an iPad), and tried out its sensors and its navigation equipment. The sensors in place for this test looked for delamination, in which cracks form below the surface of the concrete. “We did discover some delamination,” Guimaraes says, and they gave the data to the dam’s operators. When NYPA repairs the dam next year, its repair teams can check the spots located by the crawler bot. The EPRI team is now working to reduce the size of the sensor payload and to equip the bot to carry a variety of interchangeable sensors. They hope to eventually develop a commercial product. 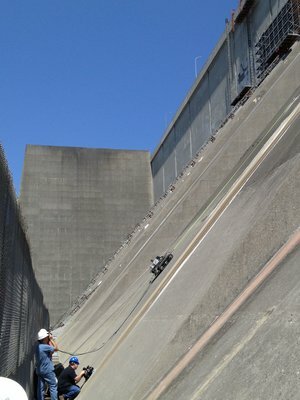 For a closer look at the bot and its field trials on the dam, check out the video below.